The Mantis Shrimp (or ‘Stomatopod’) is a small, aggressive marine Crustacean, that inhabit tropical and subtropical waters of the Indian and Pacific Oceans between Eastern Africa and Hawaii. They are beautiful and vibrant in colour, but also deadly, able to club prey with the force of a bullet, or spike them with their sharp claws. They are members of the order Stomatopoda and taxonomy group Crustacea, which are hard-shelled animals, such as crabs, lobsters, crayfish, shrimp, krill and more. The mantis shrimp is notorious for their striking force, and have the nickname ‘thumb splitter‘, due to the painful gashes they can cause if handled without care by humans. There are around 450 species of mantis shrimp worldwide, and their colours range from shades of brown to bright, green, red and blue. The most infamous species is the Peacock mantis shrimp (also known as harlequin mantis shrimp, painted mantis shrimp, or clown mantis shrimp), and is one of the larger, more colourful mantis shrimps commonly seen. They typically grow to around 10cms (4 inches) in length, but some have been recorded to be as large as 46cms (18 inches). The mantis shrimp’s shell (known as a ‘carapace’) covers only the rear part of the head and the first for segments of the thorax. While they are relatively common, they are not particularly well understood species as they are solitary and territorial sea creatures, spending most of their time hiding in rocks and burrowing in the sea bed. They are most commonly found in U shaped burrows at the base of coral reefs. Depending on the species, they can be active during the day or entirely nocturnal. 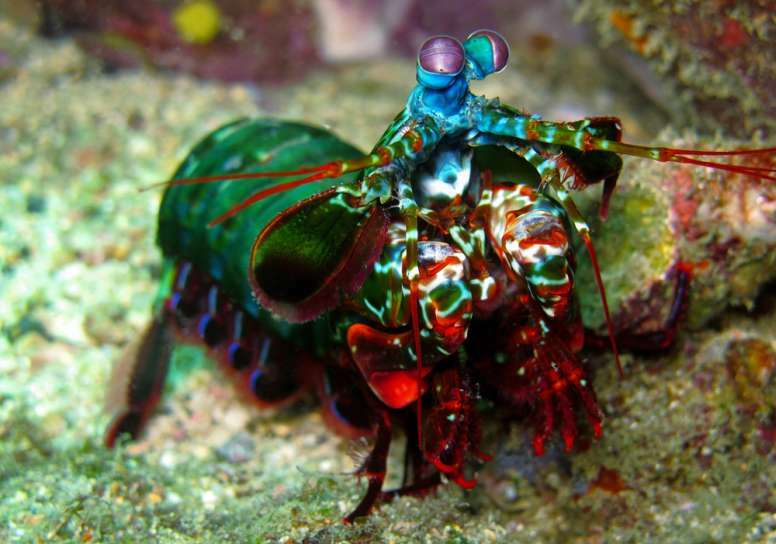 Mantis shrimp are a violent predator and their diet depends on the species. They typically eat fish, crabs, clams, snails, worms, shrimp and squid. They can also prey on animals much larger than themselves, due to their significant power. 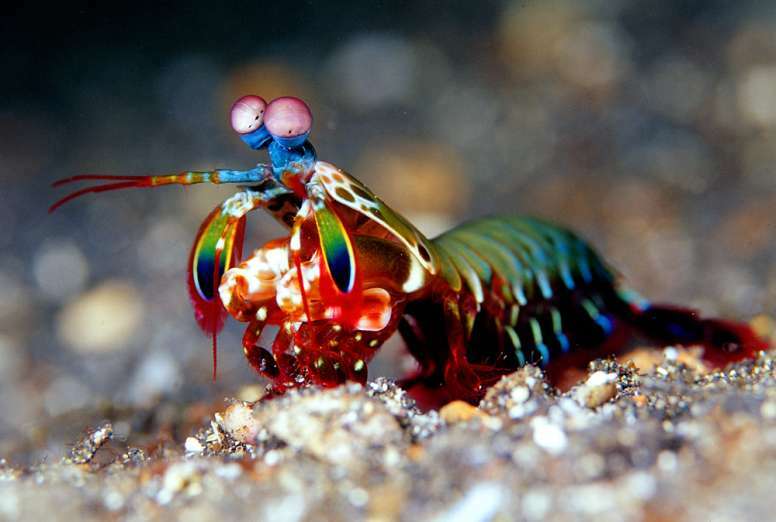 Mantis shrimp are not considered to be threatened or endangered by the IUCN. 1. All mantis shrimp species can be divided into ‘spearers’ or ‘smashers’, based on the types of claws they have and tactics they use to kill the prey. Spearers have spiny appendages with barbed tips, that are used to stab soft-bodied prey, such as different types of worms and fish. Smashers have more developed club-like appendages that are used to blugeon and smash their prey to pieces. 2. Smashers can punch at same velocity as a gunshot from a .22 caliber rifle. Smasher mantis shrimp have two raptorial appendages (called ‘dactyl clubs’) on the front of its body that it uses to punch its prey. These fists are spring loaded, able to accelerate from their body at over 50 mph, delivering a force of over 1,500 newtons, enough to smash through crabs and clam shells. That’s 2.5k times the force of the shrimps own weight, if a human could do that they’d be able to punch through steel. 3. Their punch is so fast it results in ‘cavitation’ bubbles. This is a super heated bubble and small flash of light, which for split seconds also generates temperates of 4,400c (which is nearly as hot as the sun) in the surrounding water. When the bubbles collapses they cause an intense shockwave which is like a double punch and can stun, dismember or kill prey instantly – even if the mantis shrimp misses the target. 4. They can crack and punch holes in aquarium glass. While they are highly desired, they require special stronger aquariums. When they encounter an obstacle they wish to move, they often try and punch their way out. They have also been known to attack their own reflection through the glass. 5. Their clubs have a special shock absorbent core which stops them from breaking. 6. They are not actually shrimp. Or Mantis. The mantis shrimp is not a shrimp, and it’s not related to the praying mantis, either. Instead, mantis shrimps are 450 different species belonging to the order Stomatopoda. 7. Mantis shrimps get their name from their appearance. They have a second pair of prey-catching arms that are greatly enlarged, like Mantises. They are shaped like the large grasping forelimbs of the praying mantis insect, which captures prey. 8. Eyes of mantis shrimp are located on the long stalks that can move independently. Each eye has ‘trinocular vision’, which means it can gauge depth and distance on its own by focusing on objects with three separate regions. They can see a special spiralling type of light called circularly polarised light that’s not been documented in any other animal. They also have a structure in their eyes that’s similar to technology found in DVD players, only much more advanced. 10. 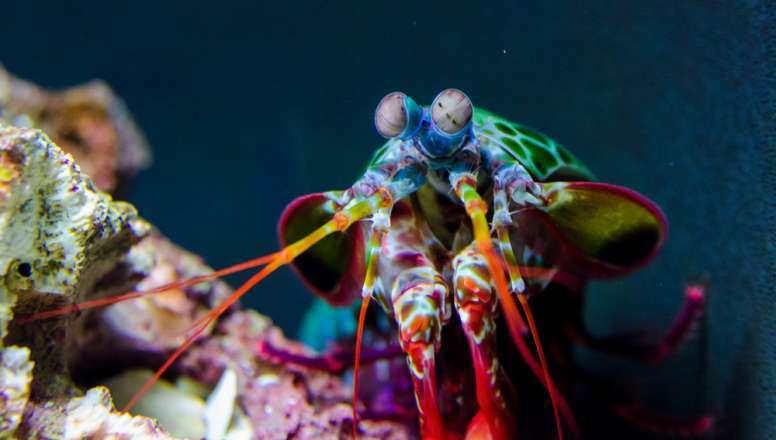 The mantis shrimp has 12-16 different colour photoreceptors for colour analysis in their retinas. Three times more than a human. 11. Mantis shrimp can detect cancer cells with their eyes. 12. The are older than dinosaurs. 13. Some mantis shrimp species are monogamous, remaining with the same partner for up to 20 years. They live to together in the same burrow, and both male and female take care of the eggs. 14. Mantis shrimp are eaten in Japanese, Cantonise, Vietnemese, Mediterranean, Phillipino and Hawaiin cuisines. After cooking, their flesh is closer to that of lobsters tahn shrimp. In Asian culture, they are often deep fried with garlic, and chilli. “Bio-inspired impact-resistant composites”, via Science Direct. “The Mantis Shrimp Sees Like a Satellite”, via National Geographic. 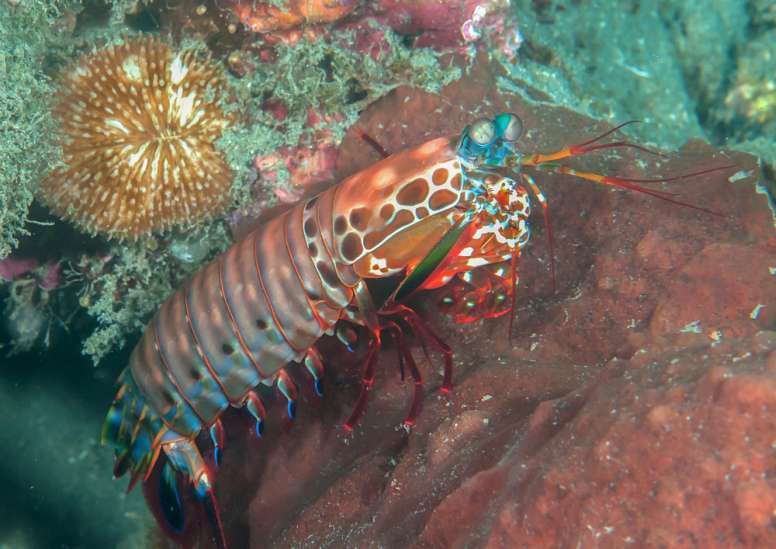 “A Mantis Shrimp Inspires a New Camera for Detecting Cancer”, via Smithsonian.com. “Circular Polarization Vision in a Stomatopod Crustacean”, via Cell.com.